Online Newspaper is just a step ahead now. With Advance Newspaper you can set up and run your very own e-newspaper site just in matter of minutes only. 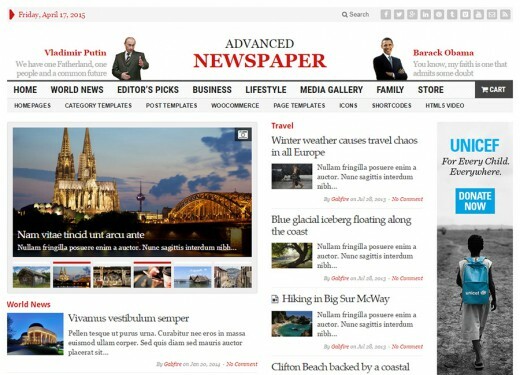 Advanced Newspaper has a unique newspaper layout that is easy to navigate and powerful, easy administration and all in one theme control panel. Advanced Newspaper has been designed to perfectly fit any screen. We took the time to make sure each and every pages of theme re-sizes beautifully, no matter what device is used. Are you planning to start an online store? Advanced Newspaper includes support and custom styling for the most popular e-commmerce plugin, WooCommmerce. How about to switch between different homepage templates with one click? Advanced Newspaper is built with support to multiple homepage layouts. You wont find this option available for many themes, but we have now turned it into a standard feature for all Gabfire Themes. Advanced Newspaper packed with multiple pages templates including Archives, Full Width, Left Sidebar and some custom templates. Videos don't have to be difficult. Advanced Newspaper has an amazing HTML5 player for locally hosted videos HTML5 with subtitle support. Use the built-in color pickers in the Theme Control Panel to choose the colors that represents your brand to create a custom look. Bootstrap is a popular framework to design responsive websites, and we’ve adopted it for our own purposes. This theme also includes Font Awesome - hundreds of font icons. You upload the photos and leave the rest to Advanced Newspaper. It will automatically grab all the uploaded images and display them above the entry with a neat slider. International? No problem - Advanced Newspaper was built to work with multiple languages. It is also compatible with WPML's multilingual plugin.